C and A’s relationship is more than just Sun sign compatibility of Pisces and Aries. No individual is a pure Pisces or Aries but instead is a unique combination of signs and planets. The following interpretation defines the synastry or interplanetary aspects between the planets in A’s birth chart and the planets in C’s birth chart. There is no evil planet in the combinations. No single combination can make or break the relationship. The list goes from the most harmonious (positive) to the most discordant (negative). A’s Mercury Trines C’s Jupiter (+14.99 harmony) – A’s mentality and powers of perception combine very effortlessly with C’s sense of growth, expansion, or generosity. Wit and humor are abundant in the relationship. Exchange of ideas is enthusiastic and friendly. A’s thoughts are in harmony with C’s dreams. C’s faith deepens A’s intellectual self-confidence. C sympathizes with A’s desire for mental advancement. A respects the moral, spiritual, and intellectual abilities of C.
C’s Venus Sextiles A’s Jupiter (+8.91 harmony) – C’s sense of sexuality, attraction, or intimacy combines pleasantly with A’s spirit of growth, expansion, or generosity. Both enjoy the same pastimes, cultural activities, and other forms of entertainment. There is natural stimulation in the relationship that brings out good qualities like optimism and self-confidence in each other. C’s Venus Trines A’s Neptune (+8.23 harmony) – C’s sense of sexuality, attraction, or intimacy combines very effortlessly with A’s sense of spirituality, imagination, or mystical inclination. There is harmony in each other’s mutual interest in nature, religion, art, music, or arcane studies. The relationship brings out kindness, sympathy, and generosity toward each other. C is willing to overlook A’s faults. A is delighted to be loved in such a sophisticated manner. A’s Mercury Trines C’s Neptune (+7.45 harmony) – A’s mentality and powers of perception combine very effortlessly with C’s sense of spirituality, imagination, or mystical inclination. There is harmony when C inspires the creativity of A. A’s practical suggestions give form to C’s abstract ideas. Both can discover many interests through excellent communication. The relationship brings a feeling of great pleasure and happiness through sharing of creative projects. C’s Venus Sextiles A’s Mars (+5.75 harmony) – C’s sense of sexuality, attraction, or intimacy combines pleasantly with A’s sexual drive, temper, and powers of self-assertion. A’s desire stimulates C’s loving nature. Both are strongly attracted to each other. This aspect is favorable in marriage and offers a sexually satisfying relationship. C’s Saturn Trines A’s Neptune (+1.47 harmony) – C’s sense of commitment, necessity, or duty combines very effortlessly with A’s sense of spirituality, imagination, or mystical inclination. C’s practical instincts are in harmony with A’s visions and dreams. C has a good sense of reality that A might not have. A is aware of a different dimension that can help C.
A’s Moon Trines C’s Venus (+0.96 harmony) – A’s emotional needs combine very effortlessly with C’s sense of sexuality, attraction, or intimacy. There is harmony in the deep mutual devotion and affection in each other. C’s cuteness charms A’s soul. Both are in agreement on creative undertakings and social engagements. A and C can easily forgive each other on minor conflicts. This aspect boosts a strong physical attraction for love and marriage. A’s Sun Conjuncts C’s Venus (+0.78 harmony) – A’s sense of identity, ego, will, and character combine with C’s sense of sexuality, attraction, or intimacy. A has the same social interests and cultural values as C. There is an increased understanding of one another. The relationship encourages love, happiness, contentment, and creativity. Both C and A enjoy each other’s company. C’s Venus Sextiles A’s Saturn (+0.74 harmony) – C’s sense of sexuality, attraction, or intimacy combines pleasantly with A’s sense of commitment, necessity, or duty. A’s protective nature stimulates C’s loving nature. Trust is a rare and precious part of the association. This aspect is good for a long-term relationship. C’s Sun Conjuncts A’s Mercury (neutral) – C’s sense of identity, ego, will, and character combine with A’s mentality and powers of perception. There is effective communication and fewer misunderstanding between C and A. Both can work together in their similar ideas and points of view. C supports the progressive ideas of A. A understands the unique individuality of C.
C’s Uranus Conjuncts A’s Pluto (neutral) – C’s sense of independence, freedom, and originality may combine or resist with A’s sense of transformation, change, or power and destiny. The intensity will depend on other factors of the relationship. This is favorable if C and A have more aspects in harmony than in discord. C’s Venus Opposes A’s Uranus (-1.18 discord) – C’s sense of sexuality, attraction, or intimacy confronts and challenges A’s sense of independence, freedom, and originality. Occasional disappointments in each other can cause tension and temporary separations. Both may be fickle toward each other and cannot depend on one another. The relationship has an erratic, unstable, but intoxicating quality. C’s Mars Squares A’s Jupiter (-1.84 discord) – C’s sexual drive, temper, and powers of self-assertion interact stressfully with A’s sense of growth, expansion, or generosity. There is friction in C’s instincts and A’s ethical point of view. There is a natural tendency to be extravagant in one or both individual. A’s Venus Opposes C’s Mars (-2.05 discord) – A’s sense of sexuality, attraction, or intimacy confronts and challenges C’s sexual drive, temper, and powers of self-assertion. There is a strong sexual attraction between A and C in the early stage of the relationship. Too much stimulation causes tension and disputes. C feels suffocated by A’s possessiveness. A can be deeply hurt by C’s thoughtless words. A’s Venus Squares C’s Jupiter (-2.06 discord) – A’s sense of sexuality, attraction, or intimacy interacts stressfully with C’s spirit of growth, expansion, or generosity. There is friction on how each other handle finances. C may occasionally accuse A of not being entirely open and honest. A may accuse C of being too open and honest. From time to time this aspect can bestow good luck. C’s Venus Opposes A’s Pluto (-3.00 discord) – C’s sense of sexuality, attraction, or intimacy confronts and challenges A’s sense of transformation, change, or power and destiny. There is an intense and sometimes uncomfortable sexual attraction in the relationship. There is tension in dealing with issues of jealousy, possessiveness, and volatile emotions. The association may breed anger and even hatred of one another. C’s Jupiter Squares A’s Uranus (-3.04 discord) – C’s sense of growth, expansion, or generosity interacts stressfully with A’s sense of independence, freedom, and originality. There is friction in C’s aspirations and A’s individualistic ideas. A will seem rebellious or unstable to C. One or both will show extravagance and resistance to responsibility. A’s Mercury Conjuncts C’s Saturn (-3.41 discord) – A’s mentality and powers of perception may combine with C’s sense of commitment, necessity, or duty. A may feel inadequate when C imparts knowledge and wisdom. C has the tendency to discipline A. A may feel the pressure of responsibilities demanded by C. A can talk C out of negative attitudes. A can encourage progressiveness in C.
A’s Sun Squares C’s Jupiter (-4.78 discord) – A’s sense of identity, ego, will, and character interact stressfully with C’s spirit of growth, expansion, or generosity. A and C have the tendency to encourage each other’s self-indulgence, extravagance, and recklessness. There is friction in individual ego, ambition, and belief. Both C and A may see each other as demanding or overbearing. They expect too much from one another. A’s Sun Opposes C’s Mars (-5.44 discord) – A’s sense of identity, ego, will, and character confront and challenge C’s sexual drive, temper, and powers of self-assertion. There is a competitive bond between A and C. Tension and power struggle is typical in the relationship. Cooperation is difficult to achieve, and there is a tendency to fight over objectives. There is a natural level of irritation when C and A are together. A’s Saturn Squares C’s Uranus (-5.67 discord) – A’s sense of commitment, necessity, or duty interacts stressfully with C’s sense of independence, freedom, and originality. There is friction in the conservative principles of A and the progressive nature of C. A will restrict C’s progress and expression of individuality. C will rebel against the traditional and controlling character of A.
C’s Sun Squares A’s Neptune (-5.92 discord) – C’s sense of identity, ego, will, and character interact stressfully with A’s sense of spirituality, imagination, or mystical inclination. The friction between C and A can cause misunderstanding, doubt, confusion, distrust, deception, and sometimes infidelity. There is a lack of trust in the relationship. A can be elusive, misleading, or even deceptive towards C.
C’s Mercury Squares A’s Neptune (-6.29 discord) – C’s mentality and powers of perception interact stressfully with A’s sense of spirituality, imagination, or mystical inclination. A’s indulgence in random thoughts can cause confusion in C’s method of thinking. Both C and A are capable of lying to each other. A’s willful dishonesty can lead to misunderstanding and friction in the relationship. One or both may keep secrets about past relationships as a method of self-preservation. A’s Mercury Opposes C’s Pluto (-6.61 discord) – A’s mentality and powers of perception confront and challenge C’s sense of transformation, change, or power and destiny. C has a natural tendency to dominate if A appears weak. There is tension in the relationship that both C and A will be uncomfortable with each other. The intensity can sometimes feel overpowering. A might have difficulty being heard out of fear of making C unhappy. A’s Moon Squares C’s Neptune (-9.44 discord) – A’s emotional needs interact stressfully with C’s sense of spirituality, imagination, or mystical inclination. There is friction in the overly sensitive moods and feelings in the relationship. Both are capable of keeping secrets to each other that can lead to misunderstanding. C can be deceptive or dishonest to A. A can overreact to the confusion caused by C. This aspect is unfortunate for marriage. A’s Mercury Opposes C’s Uranus (-9.89 discord) – A’s mentality and powers of perception confront and challenge C’s sense of independence, freedom, and originality. There is tension when both minds meet. C may seem unstable and erratic to A. A may seem elusive and contradictory to C. C stimulates, excites, and irritates A’s mind simultaneously. A can’t understand the complex mind of C. Understanding and adjustment to each other are difficult to achieve in the relationship. A’s Saturn Squares C’s Pluto (-10.60 discord) – A’s sense of commitment, necessity, or duty interacts stressfully with C’s sense of transformation, change, or power and destiny. There is friction in the struggle for power and authority in the relationship. C being a reformer might challenge A’s attitude towards responsibilities of life. C’s Mercury Squares A’s Saturn (-12.42 discord) – C’s mentality and powers of perception interact stressfully with A’s sense of commitment, necessity, or duty. There is friction in A’s criticism and disapproval of C’s achievements. C may seem careless and annoying to A. A may appear cold and bossy to C. The friction in the relationship can be a challenge to help each other grow in wisdom. C’s Sun Squares A’s Saturn (-12.98 discord) – C’s sense of identity, ego, will, and character interact stressfully with A’s sense of commitment, necessity, or duty. There is friction in A’s controlling nature and C’s egocentric nature. C struggles to break free from the limits set by A. Both will want to achieve their goals in life but may find it challenging to meet the demands of one another. There is a particular element of responsibility and criticism in the relationship. C’s Saturn Opposes A’s Pluto (-14.29 discord) – C’s sense of commitment, necessity, or duty confronts and challenges A’s sense of transformation, change, or power and destiny. There is tension in the relationship when C and A compete for influence and dominance. A may try to reform C’s strict and severe attitudes toward life. C’s conservative opinion weakens the inner energy of A. There are 3 mutual receptions in A and C’s planet combinations. Planets in mutual reception enhance each other. This will add +30 harmony to the total score. The remaining +3.63 harmony are due to some minor aspects or planets in parallel. 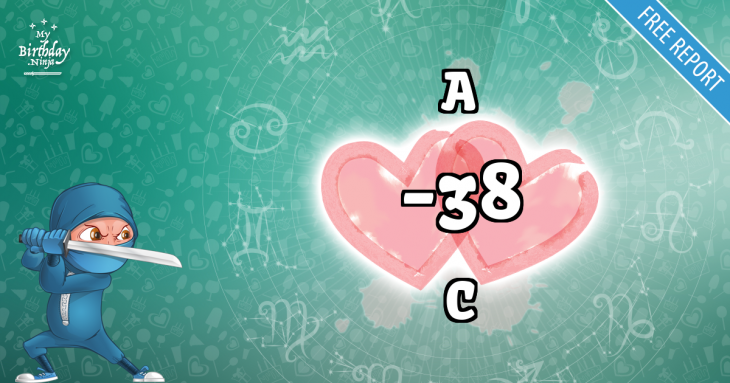 This is only a quick assessment of the relationship compatibility between A and C. If both place and time of births are known, an in-depth interpretation is available in the Star Lovers Report. Try a free sample with no obligation to buy. Ssshhh! A, don’t let C know. You are most compatible with a person born on August 18, 1987. You have a whooping birthday love match score of +159 with that person. Check it out and imagine what it feels like to be with your soul mate.